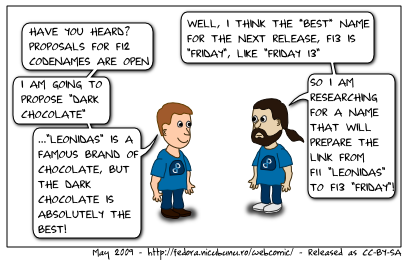 Technically, this is not a comic but I had to mark somehow the naming selection process for Fedora 12. You should think of a a name which allows us to have F13 as "Print Screen/SysRq". The next key aster F12. I think we should figure out a way to name F13 "Keating" after Jesse, who has put a huge amount of time into building the distro that we all love so much. Either that, or "Ponyfarm."